The trade in corn was one of Chichester's major industries, standing at the centre of an important grain growing area, and the development of Chichester was partly linked with the success of the corn trade. Up to the early 18th century this trade was carried out in the old corn market house which stood in North Street close to the present day Butter Market. It was described by James Spershott in his "Records of Chichester" as 'standing upon posts or framed timbers' with 'stairs up into the council chamber, which was low and had low windows'. It was first recorded on a map by Norden from 1595. The building was also utilised for meetings by the City Council, the minutes for these dating back to 1685. By the late 1720s, the building lost favour and was eventually demolished in 1731. The Council subsequently came to an agreement with Roger Morris to build the Council Chamber at its present location on North Street. 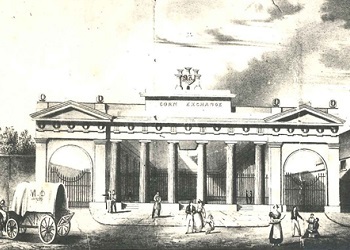 The building that became the Corn Exchange was built in East Street between St John's Street and Baffins Lane in 1832-33. This area had been known as the New Town and had, up until the dissolution of the monasteries by Henry VIII, been occupied by the Blackfriars. Seventy of the most prominent corn merchants of the area subscribed between £25 and £250 each to finance the building. It was one of the first Corn Exchanges to be built in England. It was designed by a local architect, George Draper, who also designed St Bartholomew's Church Westgate, the infirmary on Broyle Road and Goodwood's original grandstand. It was built with extensive warehouses and stores attached to the rear of the impressive façade with its striking pillars. Inside the corn exchange local farmers met dealers and merchants who hired the desks and stands on which sample bags were set out for inspection. Wheat, oats and barley were regularly traded. Increasingly grain was sold using a sample of the crop rather than 'pitching' the whole lot in sacks at the market. Shortly after opening, in 1835, the shareholders were called to a special meeting and were notified that the roof had been deemed unsafe and had to be removed and reinstated. For fifty years the building operated solely as the Corn Exchange; however in 1883 the managing committee decided to hire out parts of the building for use by the wider community. In 1896 Miss Maggie Morton hired it for a travelling film show. By 1910 Joseph Poole was regularly screening films under the brand Poole's Picture Palace. The hall was adapted and a cinematograph licence granted. The Poole brothers also introduced the novelty of locally shot films in to the programme so that audiences could watch such events as the Bosham Regatta and Priory Park cricket matches. However as grain sales continued the audience were often seated on corn bins at the hall's perimeter. In the 1920s following competition from other cinemas in the town such as The Olympia, located in Northgate, Poole's sold their business to Mr Stanley James who restored the original name The Corn Exchange. In 1927 the Wainwright's London and District Cinemas circuit purchased the then full-time cinema. It was closed for a period of months in order for the complete renovation and conversion into a more modern cinema with new seats and equipment. They showed the first talking picture "The Fox Movietone Follies" in 1929.